Caffeine, GERANABURN (geranium oil extract), [standardized to 1,3 Dimethylamylamine HCI] Naringin, Coleus Forskohlii. Gelatin, magnesium stearate, titanium dioxide, silica, FD&C #40. Take 1 capsule in the morning or 30 minutes before workout, and take 1 capsule in the afternoon. Do not exceed 3 capsules of White Lightning. Keep Out Of Reach Of Children. Not for use by individuals under the age of 18. Do not use if you are pregnant or nursing. This product can raise blood pressure and interfere with other drugs you may be taking. Talk to your doctor about this product. Individuals who consume caffeine with this product may experience serious adverse health effects. Individuals who are sensitive to the effects of caffeine should consult a licensed health care professional before consuming this product. Do not consume synephrine or caffeine from other sources, including but not limited to, coffee, tea, soda, or other dietary products or medications containing caffeine or phenylephrine. Do not use for more than 8 weeks. Consult with your physician prior to use if you are taking medication, including but not limited to, MAOI Inhibitors, aspirin, antidepressants, nonsteroidal anti-inflammatory drugs or products containing phylephrine, ephedrine, pseudoephedrine, or other stimulants. Consult your physician prior to use if you have a medical condition, including but not limited to, heart, liver, kidney, or thyroid disease, psychiatric or epileptic disorders, difficulty urinating, diabetes, high blood pressure, cardiac arrhythmia, recurrent headaches, enlarged prostate, or glaucoma. Discontinue 2 weeks prior to surgery or if you experience rapid heartbeat, dizziness, severe headache or shortness of breath. In case of accidental overdose, seek professional assistance or contact poison control center immediately. Avoid alcohol while taking this product. Exceeding recommended serving may cause serious adverse health effects, including heart attack and stroke. Improper use of this product may be hazardous to a persons health. Incredible Fat Burning Energizer!Incredible Fat Burning Energizer! White Lightning is a collection of today's truly effective energy boosters and nootropics! The correct synergy and ratios of the ingredients make White Lightning your obvious choice when it comes to intense, focused, undeniable energy. So, whether you are looking for a supplement that delivers the best workouts of your life or you are just looking for a great clean energy burst during the day, White Lightning is for you. Added benefits of White Lightning include its ability to vastly increase cognitive function and concentration as well as exhibiting a level of thermogenesis that will have you burning fat with each day of use. If you really want to make the most out of your workouts or find yourself needing a no-crash burst of mid-day energy, White Lightning is an absolute must have supplement! White Lightning is a collection of today's truly effective energy boosters and nootropics! The correct synergy and ratios of the ingredients make White Lightning your obvious choice when it comes to intense, focused, undeniable energy. So, whether you are looking for a supplement that delivers the best workouts of your life or you are just looking for a great clean energy burst during the day, White Lightning is for you. 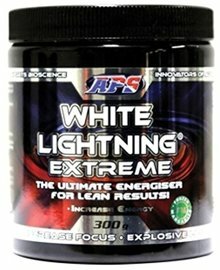 Added benefits of White Lightning include its ability to vastly increase cognitive function and concentration as well as exhibiting a level of thermogenesis that will have you burning fat with each day of use. If you really want to make the most out of your workouts or find yourself needing a no-crash burst of mid-day energy, White Lightning is an absolute must have supplement!White Lightning is an absolute must have supplement!White Lightning is an absolute must have supplement!